Parakeet leashes are really small harnesses that curtail the movement of your budgie outside of its cage. They must be used carefully because a parakeet is a fragile bird and you do not want to cause any harm. It is important that your parakeet is used to being handled before attempting to leash it. Alternatively, you can clip its flight feathers. You can make a leash, also known as a flight suit, for petite birds. They are commercially available for larger birds, like parrots, but with a little modification, you can create your own mini-version. Used stretchable cotton or elastic material for the harness. An 8-by-10-inch square should be sufficient. Fold the material in half, so the two 8-inch sides meet. Cut a 2-inch semi-circle in the center of the fold. This will be the opening for the head. Next, unfold the fabric and cut two longer, about 3-inch, semi-circle cutouts midway on both 10-inch sides of the material. These will be the flaps for the wings to fit through, like mini-sleeves. Try the harness on your bird and trim the rear of the harness as needed so as not impede the tail feather. It acts as the parakeet's stabilizer in flight. It's easiest to mark where you need to trim the fabric while your bird is trying on its harness, and then remove the harness and trim while the bird is not wearing it. Secure the two 10-inch sides just underneath where you made the sleeve cut outs with hook and loop fabric fasteners that peel apart easily. This will help secure the harness after you slip it over the bird's head. Attach with hem tape a fabric loop or sewing eye to the part of the harness that fits over the bird's diaphragm. Knot a thin cord through loop or eye to create a leash for the harness. 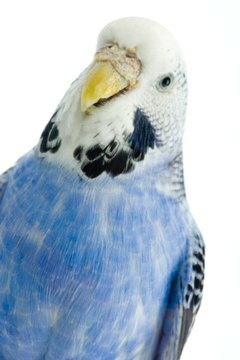 Never tie a leash to the parakeet's foot and attempt to control the bird in flight by snapping it. This can inflict severe damage. After receiving her journalism degree from Long Island University, Andrea Della Monica worked for daily and weekly newspapers in the New York metropolitan area. As a winner of George Polk award, Della Monica has been interested in advancing press freedoms. In recent years, she has successfully pursued public relations work for major community activist organizations and special interest publications. What Kind of Beak Does a Sparrow Have?